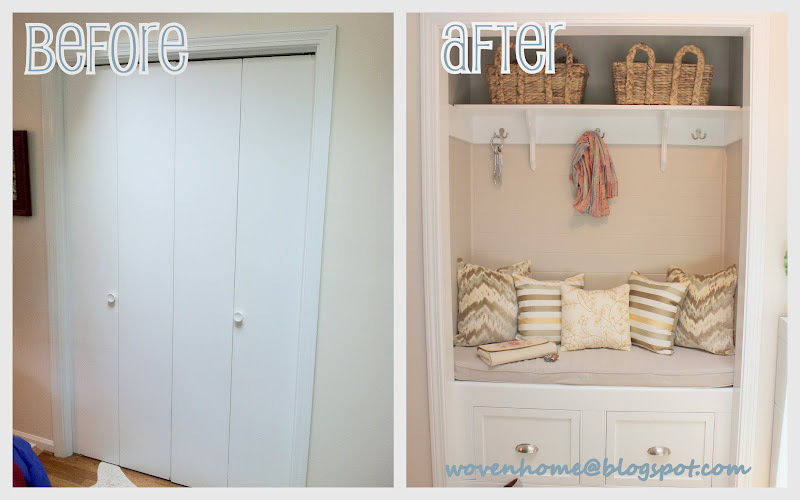 Woven Home: Entry Closet Makeover: The Reveal! This has actually been done for a couple months but like I said here... sometimes life slows you down! I really and truly couldn't love it anymore and I must say it has exceeded all my expectations. Lets look at a big, ugly, white, hollow core, bi folding before. Not quite the first impression I was going for. And.................... AFTER!!!!!! Just a little big better wouldn't you say?!? If you haven't been following along here are parts one thru three. I had mentioned in an earlier post that this was the very first thing I noticed when I walked into this house that I wanted to change (that and the giant green metal doors.) You can see the outside transformation including the new doors here. Baskets from T.J. Maxx up top for extra storage of mittens, hats, etc. They were only $15 each! Steal! Beautifully crafted drawers with satin nickel cup pulls. These babies hold LOTS of shoes! The full entry including the revamped barrister bookcase seen here. I gotta say, this rug was a hand me down from my mother in law, we had to cut it down to fit this space but I LOVE it absolutely to death!!!!! Don't you wish you had her for a mother in law? The view with both doors open as you come in from my sidewalk. I made all the pillows and cushion. Specifics are in Part 2. The walls are clad in wainscoting and painted in Behr Wheat Bread. I would love to give you a complete cost break down but the receipts are literally everywhere and after returns and about 20 trips they just all got separated. I can estimate it came in between $300 and $400. After buying all the wood, the wainscoting, hooks and pulls, fabric and foam for the seat. Not terribly bad considering the estimate I got last time I wanted something built in! Big pat on the back Will.... you're the man! I gotta say my major inspiration for this project was from the House of Smith's. I must give her a shout out and send you over to check out her amazing blog if by some crazy chance you don't already read it daily! Here is the link the her closet makeover. One final before and after. If I missed anything you have questions about leave me a comment or shoot an email and I'll get right back to you! Very clever! Much better than being greeted by closet doors. Love it!! Wow. I'm impressed. Beyond impressed. What a fabulous idea! Love the look through the door seeing the new space. Seriously, that's just genius. Wish I had a closet like that. I'd give it up for such a cool spot in a heartbeat. Thanks for sharing your creative thoughts and the implementation of them. Love it! Oh wow! I am so envious, I want a space that looks exactly like that! Beautiful! Really draws you in. get out!! this is completely stunning - so glad to have found you! I can't tell you how much i love this!!!!! I have a closet just like your before one in my entrance hall opposite my front door. Its currently housing billions of coats, shoes, vacuum etc. It would be perfect to makeover! Now I just need to convince my very handy husband, oh and will need to find a new home for my vacuum!! It's perfect! You did a great job! Thanks for sharing at the All Star Block Party! This is simply an awesome transformation - you you've got my vote! Do you have plans for those doors you took down? if you do, can't wait to see that! New follower :) I'm also having my very first giveaway! Love it! Those baskets are awesome! Fantastic! A much more welcoming entry than the previous closet doors. Totally fantastic! I had a useless closet in our foyer and I ripped it out! This is a great transformation! Love the colors! Oh my gosh this is stunning! I love the colors you chose, so bright and calming and love the pillows. Fabulous job on all accounts. Love it! Wow! It looks amazing! Never would have thought to pull the doors out and that it would look so wonderful. Great job! That is really awesome! I love what you did here! Makes me wish I had an entry closet to make over! Just one word "Awesome". Thanks for linking up at Friday Fun Party. Have a nice weekend! I LOVE the new look! LOVE IT! did I say LOVE IT? great improvement! Incredible transformation! I love this! This is absolutely GORGEOUS!! What an amazing transformation. I love your fabric choices for the pillows. Thanks so much for coming out to the party at Clean and Scentsible. I'll be featuring this on Sunday. Have a great weekend! What a beautiful transformation! So welcoming! I love it! I LOVE this idea!! 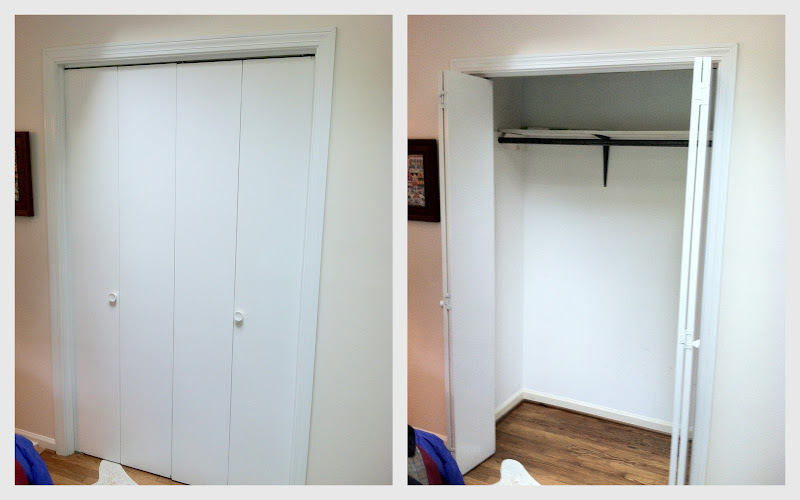 And you have given me some great inspiration for redoing my entry closet. I pinned it! New follower too :) Thanks for linking up to my party. Kandi, this is absolutely fabulous. I love it! Oh what a differnce it makes. Love the hooks, baskets, and the pillows you made. Hubby did such a great job. Thanks for sharing at Share Your Cup and I will be featuring you next week. Hey ... I wrote you a comment earlier and it isn't on here now ... hmm. I love the transformation you made of the closet! 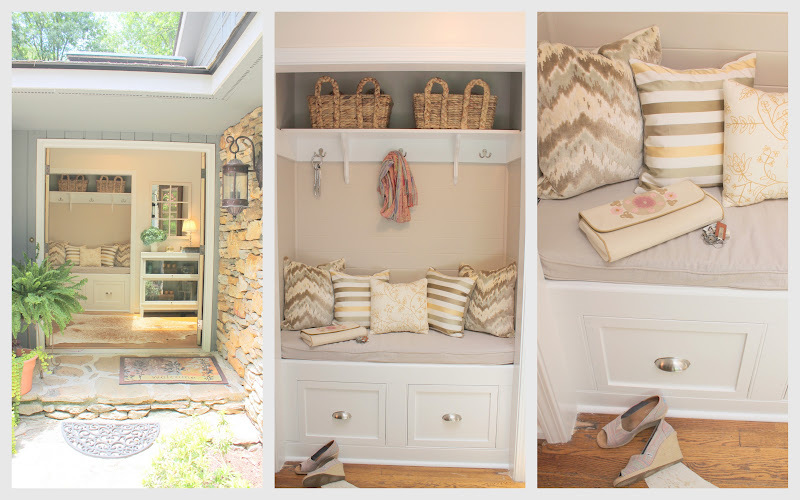 I just did something like this in my mudroom. Thank you for sharing this with us on The "Sunday Stop"! That is wonderful and a great use of space! Such an amazing transformation. Love the paint colors, the pillow fabrics - shoot, just love it all! Just beautiful! WOW! Beautiful job! Found you thru the blog hop! Following! YAY! How awesome! Featuring you this week at Things' I've Done Thursday! It's absolutely gorgeous! Looks like it's from a magazine! I recognized those baskets right away :) I aways look at them when I'm at TJMaxx & Marshalls! This is fabulous!! Thanks for sharing at Wow. I'm in love with your whole entry way! It's so breathtaking. If you get a chance come link up you reveal at my Pin Party. I want to do that so badly, but I don't have a closet that will work. Yours turned out beautiful! I love this! 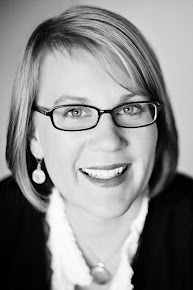 I would be happy to have you share this and any other idea you would like to link up to "One Creative Weekend" at OneCreativeMommy.com. This is a great transformation, and yes stunning! It really does look like magazine worthy. What a great use of space. So very pretty! So glad you shared your creative inspiration at Sunday's Best! AMAZING!!! You have some serious talent! I am visiting from the Thee Blog Hop. I am a little late but I just wanted to stop by! I am a new follower! 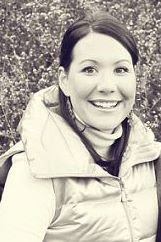 I blog over at http://www.garagesalesrus.blogspot.com/ hope you will stop by and do the same. I have an awesome giveaway going on with a Cricut machine! I would Love it if you would stop by and enter! Wow! This is beautiful! We did something similar but we still have the finishing touches like paint and pillows to take care of. Thanks for motivating me! Wow! What a transformation! You ladies never disappoint! I'm pinned and shared on FB! WOWZA this is fabulous!! Do you ever leave the room exp with the fabulous view outside :) Linking it on my fb right now. Wow, it looks fabulous! We are working on the SAME project, hope mine ends up looking as great as yours, it's beautiful! This is beyond gorgeous! It looks like it should be in a magazine! Beautiful job and thanks for such great inspiration! Incredible makeover! featured this tonight at our party! Stop by and grab a button! Wow, Wow, and more wow. This is truly amazing. What a great first impression you have created here in your foyer. I just love how creative and functional this concept is! Great job! WOW! This is amazing! Looks like it is straight from a magazine! Yall did an bang up job on this! Pinning Too! Featuring you later today from Handmade Tuesdays :). What a fabulous greeting when you walk in the door!! I wish I had a closet like that to transform. Amazing transformation, Kandi! I love the look of your entire entry. It exudes so much charm now! Thanks for linking to Time Travel Thursday. Hope to see you each week. Be sure to stop by tonight and see yourself featured. This is absolutely super. What a wonderful transformation--you've taken an eyesore and turned it into a beauty! And a beauty that's so useful. WOW! Thanks so much for linking it to Grace at Home! What a great transformation, such a pretty entry way! I may be featuring this tonight at the weekend show off party! This transformation is amazing! Thanks for sharing at Fabulous Friday. I featured you! This is gorgeous! It looks so cozy. Makes me want to just plop down and read a book there all afternoon! ;) Loving the entire entryway too, by the way! Visiting from Uncommon. This is fabulous!!! I'm so glad you shared this at HiH! :) I'll be featuring it this weekend and on my Fb and twitter later today! :) have a wonderful weekend! I love your new space! I also saw the closet done by House of Smiths, which is so pretty. So glad you linked this up at Sunday Blog Love, this will be featured as one of my favorites. Wishing you a wonderful weekend! ...oh, I forgot to mention the fab stone wall outside. Absolutely stunning!! Gorgeous! Awesome job - I love every detail and choice. I agree with my above neighboring commentator...absolutely stunning! You were featured on The "Sunday Stop"! Come by and grab a button :) I also pinned it to Pinterest. This is amazing; what a fabulous job! Oh my goodness, this is gorgeous! I'm featuring this tonight at the link party! Thanks so much for linking up!! This looks amazing!! What a gorgeous first impression people get now from walking into your doors. I love it!! Looking forward to seeing you again later today with another fabulous project! Your entryway is just gorgeous, you've done a wonderful job! I have this linked to my mudrooms and entryways post too today, for inspiration! Gorgeous! We are in the process of transforming an old farm house and I would love to do something to the entry closet! It will be a long time. We are starting with cleaning. It is kinda gross! I really like it, but just wondering.... where do you keep all your coats now? best idea I've seen of using a closet to really accent a room - excellent! coming over from whisperwood cottage - congrats on being a winner! Love your entry. I've thought about adding a cowhide to our entry forever now but get nervous that it's not practical. The entry I would put it in only has traffic when we have guests...our family rarely uses it. What has your experience been?!??! wow this is amazing home design it was so elegant .. i like it so much to have this kind of home. i was enjoy reading and seeing your home design photos. AMAZING... and so, so inspiring... Love it! When life hands you lemons... go to the beach!